Pie is definitely one of my favorite desserts. I love the flaky crust and the fruit or cream fillings. So delicious!! Unfortunately, my husband doesn’t quite share my passion….which makes these individual pies absolutely perfect! I have been intimidated a bit by pie crust, but after following Barbara Bakes’ tutorial…I have no idea why. It was so easy and delicious. I made a batch of her Perfect Pie Crust and I used half of it to make a Tomato and Zucchini Quiche which was quite possibly the best dinner I have made all month. Just thinking about it makes me want to bake one for dinner tonight. It was amazing!! I was excited to use the extra crust dough to try the individual pie jars from Our Best Bites. I have been wanting to make them for over a year. It was so easy…but you could make it even easier by using a store bought crust. I just rolled out the dough and pressed it into my small jars (I used 4 oz jelly jars. Our Best Bites used wide mouth half pints–I haven’t seen these at the store. Although, if you can find them, I bet they would work even better than 4 oz jars). I had a little crust leftover that I baked with some cinnamon and sugar on top. For the filling, I diced up a couple of peaches and mixed them with some sugar, to taste (I probably could have used a little more sugar…they were a little tart for my husband). Added in 1-2 tablespoons cornstarch (you can use flour). Our Best Bites also added butter, but I think I completely forgot it. Then I filled the jars with the filling (and ate the little bit that was left). To finish, I topped off the jars with some decorative crusts. I placed the jars on a aluminum foil lined baking sheet and baked them at 375°F for 45 min or so. Partway through the baking time, I covered them with aluminum foil to keep them from over browning. There was a little spill over and I was glad I was able to just throw away the foil instead of scrubbing a pan (or my oven). But overall, they baked up really nicely! Easy as pie! Actually, I think they might be a little easier than baking a pie. I usually have problems with my pies setting up, with these little beauties that didn’t even matter. You can eat them straight out of the jar. I personally dumped it out on a plate and ate it with some homemade vanilla ice cream. A perfect little pie! I loved that the crust to filling ratio was higher than in a regular pie slice, because pie crust is just amazing. Although, using the correct jar size might help make it a little more perfect, I’ll have to find some wide mouth, half pints. Any kind of pie could be made in this little individual form….pumpkin, apple, cherry…I’m excited to experiment with a cream pie too. I plan on making some more of these beauties and freezing them before baking. Then I can put one in the oven with dinner and I can have a nice, delicious, fresh baked pie for dessert while my husband enjoys his favorite ice cream or chocolate treat. That would definitely be the perfect way to end a chilly fall day. They would also make super cute gifts, Our Best Bites has some cute ideas on how to package them up. This entry was posted in Pie. Bookmark the permalink. i’ve had pies-in-a-jar on my to-make list forever but still haven’t tried ‘em. will have to do so soon – these turned out adorable + it doesn’t sound like they’re too difficult to make. love ‘em! Your mini pies look perfect, flaky and delicious! I’m so glad the tutorial helped you overcome your fear of making pie crusts. Thanks so much for the link love! I can’t imagine not loving pie. You’ve come up with the perfect solution. I’ve been wanting to try pie-in-a-jar for a long time, also. These are just precious! (And I love the fact that they are individually-sized; my hubby doesn’t eat many sweets, so this is portion control for me!). I haven’t been able to find the small and wide jars in the stores either. They are available online: http://astore.amazon.com/oubebi-20/detail/B0000BYD0F. I just used the 4 oz, regular mouth jelly jars. I didn’t have any problems with crust falling. Actually it raised up above the jar, which surprised me. I should have taken a picture before I baked them so you could see what they looked like. I just attached the top crust to the side crust and the edge of the jar. I also baked them on top of an aluminum foil lined pan. They did leak out a little bit and the jars were a little sticky (I forgot to write that in the post–I’ll add it now). If you try it, let me know how they turn out. Mine worked great! Those are so cute! Gorgeous! BreAna, you are amazing! I think I might be able to empty some little wide mouth jars for you! Don’t forget to ask me when we see each other! Really?! That would be awesome Mom! Too bad we don’t live a little closer. I am definitely going to have to try these. Nate is a huge fan of cherry pie, and I made one for the first time the other night, but pie crust scares me! So, I’m going to attempt these! Are you going to blog about the cherry pie? I would love to see it. I’ve never made a cherry pie before. Let me know how they turn out if you make these. Oh these are wonderful. We don’thave anything like this in the U.K, so I’d love to recreate something similar at home. These are so pretty! I’ve just recently invested in some Mason jars so I’m excited to see recipes like this. I’d like to invite you to share your recipe on Sweet Indulgences Sunday. CONGRATULATIONS!!! 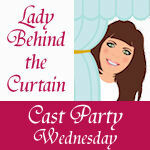 Your recipe is being featured today at CAST PARTY WEDNESDAY by Lady Behind The Curtain. Come over and get your “featured” button. 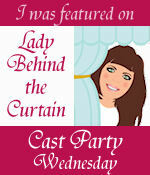 Thanks for sharing with us last week I hope you can join us again! Sorry I’m late. I noticed you already did it. I wanted to send you a Congratulations anyway. I am making these right now as apple crumb instead. I like the jar idea and had a little bit of filling and crumb from a bigger pie that I am baking. Just wanted to know if the temperature and baking time would be the same as for a bigger pie since I have never tried this before and it is!